What is the shared core of all religious and esoteric traditions? Why are there so much pain on Earth? Life is easy, why do we make it so Hard? On Education. Chaos or Order? No, Life! Is it possible to make Intelligent Machines? 🔸Truth, and goodness, and beauty, are but different faces of the same All. 🔸It was one of those evenings when men feel that truth, goodness and beauty are one. 🔸The ideals which have always shone before me and filled me with the joy of living are goodness, beauty, and truth. The True, the Beautiful, the Good — through all the ages of man’s conscious evolution these words have expressed three great ideals: ideals which have instinctively been recognized as representing the sublime nature and lofty goal of all human endeavour. In epochs earlier than our own there was a deeper knowledge of man’s being and his connection with the universe, when Truth, Beauty and Goodness had more concrete reality than they have in our age of abstraction. 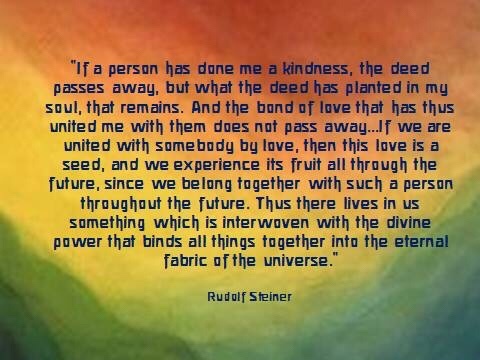 Anthroposophy, or Spiritual Science, is able once again to indicate the concrete reality of such ideals, although in so doing it does not always meet with the approval of the times. For in our age men love to be vague and nebulous whenever it is a question of getting beyond the facts of everyday life. In his pre-earthly existence man lives in a world of pure Spirit, where, in communion with higher Beings, he is engaged in building up the spiritual prototype, the spirit-form of his physical body. The physical body here on earth is but an after-copy of the spirit-germ that is elaborated, in a certain sense, by man himself in pre-earthly existence. In earthly life the human being is conscious of his physical body, but does not know what this implies. We speak of Truth, little realizing that a feeling for truth is connected with our consciousness of the physical body. When man is confronted by a simple fact, he may either form an idea that harmonizes strictly with it and thus is true, or, from inaccuracy, laziness or positive aversion to truth, he may evolve an idea that does not coincide with the fact. When he thinks the truth, he is in harmony with the feeling he has of his physical body, nay also with his sense of the connection between this physical body and pre-earthly existence. If out of laziness or untruthfulness he forms an idea that is not in accordance with the fact, it is as if he cut the thread that binds him to pre-earthly existence. Untruth severs this thread. In pre-earthly existence a delicate spiritual wool is spun, and this is concentrated into an after-copy — the physical body. Many threads connect this physical body with pre-earthly existence, and they are severed by untruthfulness. The purely intellectual consciousness that is a characteristic quality in the early stages of the epoch of the consciousness Soul does not realize that such a severance takes place. And that is why man is subject to so many illusions as to his connection with cosmic existence. For the most part to-day, man regards his bodily health from a purely physical point of view. But when, through untruthfulness, he severs the threads that bind him with pre-earthly existence, this works right down into his physical body, and especially into the constitution of the nervous system. The feeling he has of his physical body gives him his “spiritual sense of being” in the universe. And this spiritual sense of being depends upon maintenance of the threads proceeding from the physical body to pre-earthly existence. If they break, man must create a substitute for his healthy sense of being — and he does so, unconsciously. He is then led, unconsciously, to ascribe to himself a sense of being “out of the common.” But even here he has fallen into an inner uncertainty that makes itself felt even in the physical body…. What is it that can strengthen man in this sense of being? In earthly existence we live in a world that is but a copy of true reality. Indeed, we only understand this physical world aright when we realize it to be this copy of reality. It behooves us, however, to feel the true reality within us; we must be aware of our connection with the spiritual world. And this is only possible if the bond that links us with pre-earthly existence remains intact. This bond is strengthened by a love of truth and Integrity. Nothing establishes man’s true and original sense of existence so firmly as a feeling for truth and truthfulness. To feel himself in duty bound first to “prove all things” he utters, to set due restraint on all his words — this helps to consolidate the sense of existence that is worthy of his being. To be aware of the spirit within the physical body — with this, indeed, the sense of being is connected. There is, in effect, an intimate kinship between the physical body and this ideal of Truth. We acquire the etheric body (or body of “formative forces”) only a short time before the descent from pre-earthly to earthly existence. We draw the forces of the etheric world together, as it were, to build up our own etheric body. The sense of the reality of the etheric body is strengthened by the experience of Beauty. When truth and truthfulness enter the realm of real experience, we are, in a sense, living rightly in the physical body. A highly developed sense of beauty gives us a right relation to the etheric body of formative forces. 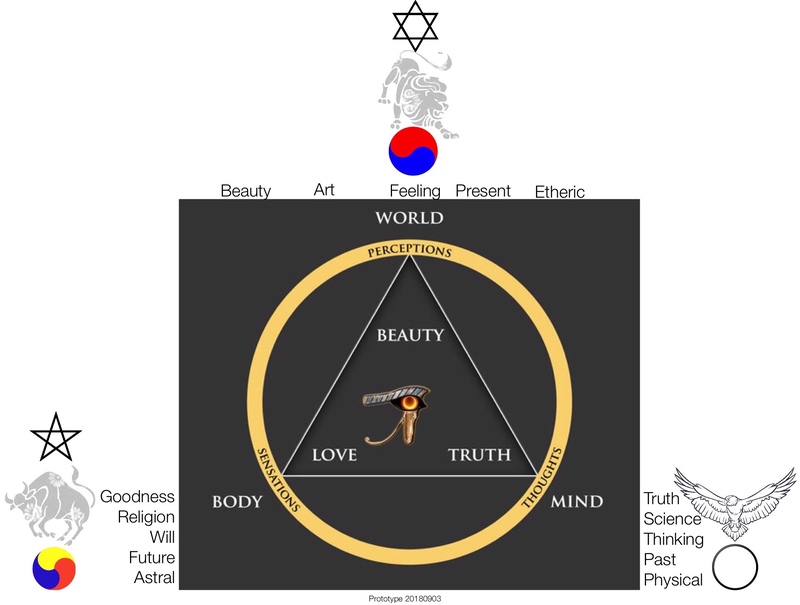 Whereas Truth is connected with the physical body, Beauty is connected with the etheric body. If we try either through sculpture, painting, or drama — indeed, through any art — to portray a human being, we endeavour to create a figure that is sufficient and complete in itself — one that contains a whole world, just as man contains the whole universe within himself in his etheric body. For he draws together the etheric forces from the whole universe to mould his etheric body within earthly existence. An intense feeling for beauty — as it was then conceived — existed in earlier ages. Nothing of the same kind is present in modern civilization, Man cannot be truly man if he has no sense of beauty. It is so, indeed; for to possess a sense of beauty is to acknowledge the reality of the etheric body. To have no sense of beauty is to disregard, to disown, the etheric body. Enthusiasm for truth and truthfulness can kindle in man — in the unconscious depths of his soul at any rate — a feeling for pre-earthly existence. …. But when this sense is highly developed, it binds man strongly to the pre-earthly past, and his more immediate experience of the earthly present must needs cause a certain sadness to arise within him. It is a sadness that can only find consolation if the sense of beauty is awakened in the soul. Beauty gives us joy once more, even in the presence of a sadness that must always accompany great enthusiasm for truth. In a delicate, subtle way this enthusiasm tells us: Truth, alas, is only really present in pre-earthly existence. …. Only enthusiasm for truth can help us to maintain intact our relationship with pre-earthly existence. 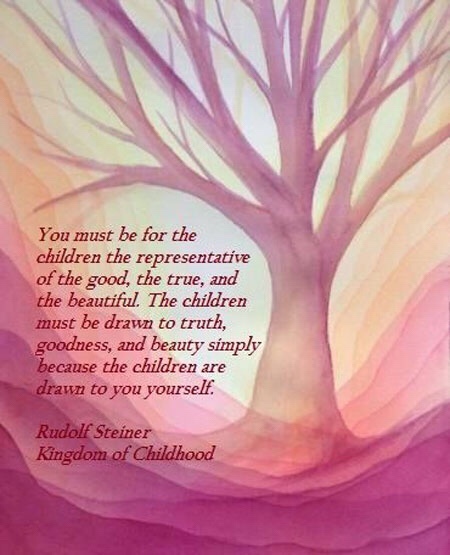 We ought never to undervalue the significance of beauty in education and in outer culture. A civilization that is filled with ugly machines, with chimneys and smoke, and dispenses with beauty, is a world that makes no efforts to forge a link between man and pre-earthly existence; indeed, it tears him asunder. The world of spirit in which we live during our pre-earthly existence is always present. We have but to stretch out our arms, as it were, to this pre-earthly world of spirit. Although it is always there, a link can only be forged in the depths of unconscious life when man glows with enthusiasm for truth and truthfulness. And when his heart thrills with love for the beautiful, this too forms a bond with pre-earthly existence. …. To glow in response to beauty means that in his soul man must create in a picture, at least, a new link with pre-earthly spirituality. A good man is one who can bear his own soul over into the soul of another. Upon this all true morality depends, and without morality no true social order among earthly humanity can be maintained. When this true morality develops into momentous impulses of will which then pass to reality in moral acts, it begins to be a quickening, all-pervading impulse in the soul, inasmuch as a man can then be moved to real sympathy at the sight of care on the face of another — his own astral body feels pain at the sight of suffering in others. Truth, then, is related to the physical body, Beauty to the etheric body, Goodness to the astral body. Here we have the concrete reality of the three abstractions of Truth, Beauty, Goodness. These ideals show us how far man is able to fulfill his whole human nature, when, to begin with, as he lives in his physical body, he is filled with a real sense of truth instead of conventional opinions. Again, full “humanity” is only afforded a worthy existence when a man can quicken his etheric body into life through his feeling for beauty. …. One can merely gaze at beauty or one can experience it. …. To gaze at beauty is not to experience it. The moment we experience beauty, however, the etheric body is quickened. A man may do good because of some convention, or because punishment is in store for serious wrong-doing — or, again, because other people will respect him less if he does wrong. He can, however, also do good from sheer love of goodness. … Such an experience of goodness will always lead to a recognition of the reality of the astral body. Indeed, only this recognition will teach man anything about the essence of goodness. There can only be abstract knowledge of and inconsequent chatter about goodness, if loving enthusiasm for goodness in its essence does not lead to actual experience of the astral body. ▪️The sense of truth is a heritage from pre-earthly existence. ▪️The sense of beauty will create an image, at least, of pre-earthly connection with spirit. ▪️Experience of goodness is a link, leading directly to the world he enters after death. To be true is to be rightly united with our spiritual past. To sense beauty means that in the physical world we do not disown our connection with spirit. To be good is to build a living seed for a spiritual world in the future. Past, present, future — these three concepts, as they play their part in human life, assume far-reaching significance when we understand the concrete reality of the other three concepts — Truth, Beauty, Goodness. The man who is untruthful denies his spiritual past; the liar severs the threads between himself and his spiritual past. He who disregards beauty is building himself an abode on earth where the sun of spirit never shines, where he wanders in spiritless shadow. The man who belies the good renounces his spiritual future; and yet he would like this future to be bestowed on him, may be by means of some outer remedy. Book of Job and "The Dark Night of the Soul"
Edgar Cayce – File Index of Readings! Uranos Archiv – Texts in German, not found elsewhere.